Wow....we have been swamped so this is going up a bit later than usual! A couple of weeks ago, we shot Liz and Scott's engagement session in the North End, Waterfront and Christopher Columbus Park. It was one of the first really warm days, so the North End was bustling with tourists, holding their Mike's Pastry boxes catching all the historic sites. We were a little worried it would be hard to shoot around them, but we lucked out! 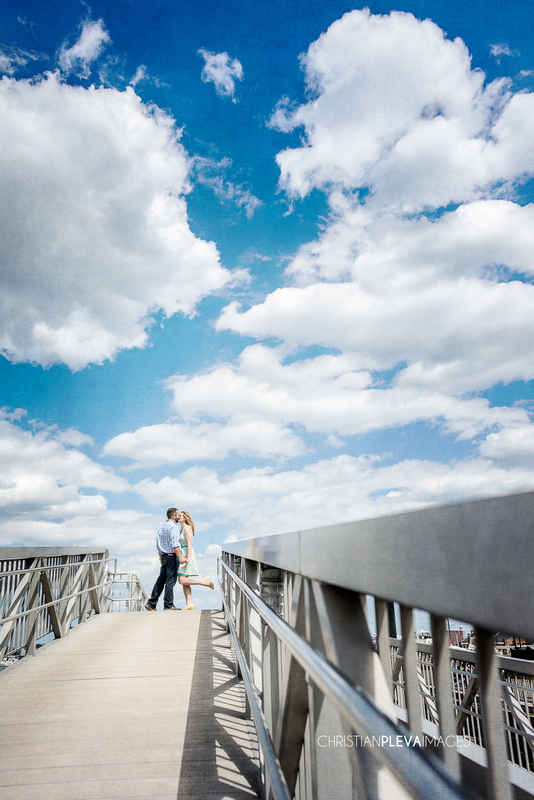 I love the mix of artistic, intimate and landscape shots we were able to get on this shoot, and the clouds were definitely on our side! Their advice for engagement shoots was, "Just relax, have fun and be prepared to kiss a lot! HaHa!". That is true, we will be looking for a little public displays of affection, so being prepared for that is always a good thing! Regarding their overall experience on their North End engagement session they said, "It was so much fun! We don't ever dress up and take professional pictures, so we weren't sure what to expect but it was a lot of fun!". Well, on our end you looked like you take pictures all of the time! You guys were great and so natural, we couldn't even tell you were having side conversations through your smiles! LOL!!! I hope you enjoy the sampling and we can't wait for the next 45 days to be over and your wedding to be here!!!! !